Allow me to introduce Parthajeet Sarma. His introduction on his official website reads: A graduate of Sir J J College of Architecture, Mumbai, Parthajeet went on to complete an MBA. After years of industry experience, he was selected by the British Government to do a leadership program on science and innovation at Oxford University. The book is a good comprehension about the things changed over time. Workspace is the place where we spend a remarkable amount of time (as a professional, we spend even more time to our workplace than our home) and the evolution there is the result of changing times and the nature of work. We found his short book a good summary and impressed by his clear thoughts and summarizing abilities, we’ve decided to have a Q/A session with him. Fortunately the things worked out positively and here is the entire author interview with him. We are glad to have a conversation with you. Of course, it is not your first book, but every book is special for an author. As your book is getting both commercial success and critical acclaim gradually. Can you share your feelings? Well, there are no immediate fireworks and accolades upon publishing a book; it tends to gather steam gradually. I am glad with this as it is like an exoskeleton of what I do, and of the work that I live, eat and sleep. The kind of work that I have been doing in recent times, has been a bit niche, especially in the Indian context. 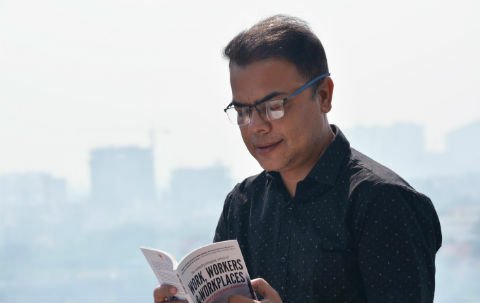 The book has helped in spreading the message; that modern day workers need to be treated as internal customers by organisations and not as tools to get work done. Yes, in a way. The more I become people centric in the consultancy work that I offer, the less I feel I know about the human brain and what impacts productivity. So there is a constant yearning to learn more. At any point in time, when I write a book, I do feel that this is the best possible book I could produce under the given time and space. Today when I look back at my initial works, I feel I was so naïve in my writings. So, yes, there is a sense of fulfillment today, but there is still much more to learn. You learn something new every day and thus completeness is not a destination but a journey. 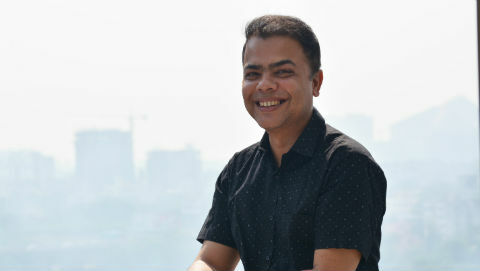 I am an Architect who does not design buildings J Well, I graduated in Architecture from Sir J J College of Architecture in 1995, and later went on to do an MBA. I have always been fascinated by observing human behavior and have felt the need to do things, which help improve human lives. This interest, coupled with my background in design, set the platform for me to design experiences for organisations in the workplace, that augment employee wellness and increase productivity. I work hand in hand with organisations, at a strategic level as a consultant, on workplace strategies that enhance human productivity. I push the limits when it comes to work and have constantly tried to be human centric in the workplace consultancy that I do. So there is constant evolution and learning, especially since you are dealing with the human mind. I like to share the learnings. Although I conduct workshops for this, I find that books have a far greater reach, and hence I dedicate a part of my time towards writing books. Moreover I often hear back from readers; and their feedback helps to co-create new ideas, which is very exciting. Please share something about your other book(s). My first attempt at writing was a book called “Smart phones, dumb people?” This was a general commentary about how technology seems to be making humans dumb. This was more than five years back and so much has changed in the world since then. The verdict is not yet out, but humans have certainly lost some skills and picked up new skills, because of technology. My second book was titled “The Rich Labourer”. I attempted a fictional twist in this case, to make a point about how one can certain tried and tested principles (based on design thinking) to improve human lives professionally and at a personal level. “Work, Workers and Workplaces” is rather a different kind of book. Some may consider it as a whitepaper of your business. Can you share what made you write this book and what are the major challenges you faced when writing this book? Scientific and social science experiments conducted for many ages prove beyond doubt the influence of certain aspects in improving human productivity and wellness. Although the linkage of ‘human feelings’ and productivity is well established, our organisations have traditionally not been designed and run in cognizance of this. It is only in recent times that human feelings have become important at the workplace, from an organisation’s perspective. So today workplaces are designed in a manner that makes workers ‘feel good’. This recent shift is also because of the fact that most of the ‘non-emotional’, left-brained, repetitive work has been automated; so most humans today are increasingly doing more of such work that requires them to tap onto their emotional side. This shift is still new and not organisations are still grappling with how to make this shift. After having worked as a consultant in this domain for more than two decades, I thought it was about time I gave a summary of my thoughts and learnings through the book. In a way, what you find in the book is only the ‘tip of the iceberg’. The only challenge I faced was to write it in a manner that would become palatable by those not yet initiated into this process of change. So I used anecdotes and analogies to explain a few things. Can you share which segment of the book you enjoyed writing more? The beginning is the most difficult when you try to structure your thoughts into text that will be understood by people. Once this was done, the rest was enjoyable. I write about designing for all five senses, and I truly believe in this and enjoyed touching upon this. Through a sensory design approach, I like to think that everything can be designed. Human behavior can be designed. I focus on doing this, through designing experiences for organisations’ employees. This is very simple to understand through an analogy; you think of a visit to a place of worship; as you enter the space, the surrounding environment has an impact on your mind, on your thinking. It brings a certain change of mood. In ancient times, this change of mood was designed through the clever use of spaces, through sights, smells, sounds and touch. I live, sleep and eat what I have written in the book, so in a way it is an extension of me. In that sense, there is some method out there. However that urge to write seems to come on impulse; I have these moments in my life when I feel the urge and drive to write, and when that comes my writing seems to be in flow. Oh yes, very much. I knew what I wanted to depict and became a model myself for the cover! Once the right picture was selected, I worked with the design team closely on the colours, fonts and other aspects of the cover. I had a rather strange journey. When I wrote my second book, “The Rich Labourer”, I had sent out the manuscript for publication to a few publishers. I was a bit short on patience, waiting to hear back from publishers, and got it self-published. One of the publishers got back saying that they would like to publish “The Rich Labourer”; but by then the book was already out there on the e-commerce platforms. So I asked them if you would like to publish my next book. When they said they would, I began to put together my thoughts for ‘Work, Workers & Workplaces’. In a way, I was privileged to have a publisher up-front for my latest book, and that made my job easier. However there was a bit of self-inflicted pressure to complete the book within a rather tight deadline. Every book affects its author in some way. How do you think writing “Work, Workers and Workplaces” affected you. 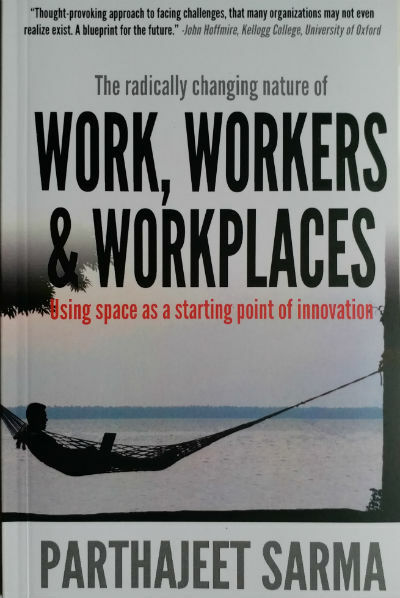 “Work, Workers & Workplaces” has largely been a summary of learnings from my professional work. While it is easy to talk about my work from my perspective, when you write a book, you have to put yourself in the shoes of the reader and write in a way such that he or she can understand your point of view. So, writing this book firstly brought clarity to my thoughts related to my professional work, and secondly made me more emphatic to the needs of the audience. Why one should read “Work, Workers and Workplaces” according to you? This is not easy for me to answer. One good reason to read the book would be the fact that this is probably the first book which gives a hint of linking results of scientific and social science experiments with human productivity at the workplace. For instance, we all know that a ‘good view’ makes us feel good. But do we know what is the science behind it? Secondly, what is the linkage of that with human productivity and hence profitability. All of this is explained in simple language, making it an easy read. As you need to travel a lot for your work and having tight schedules, please share some of the time management tips you are implementing in your life, to do multitasking! Well, I do not like the phrase “work-life” balance; I think it is quite meaningless in a world where work and home life is blended, and the physical and digital world is blended. For me, its one blended life and as I only do things that I like doing, I do not have to think much about multitasking. The sum of all those little parts is what makes me what I am. So, perhaps the trick is to follow one’s passions and do things that one likes doing, and not those that one ends up doing even if one does not like doing it. I am lucky to have a supportive family in following this. I mostly read non-fiction. As for fiction, I like to stick to watching movies. I like to experiment with cooking a bit. I do not follow recipes but get creative with my own ideas. In recent times, I have tried my hand at making food that is tasty and is devoid of oil and other ‘not so good’ elements like salt, flour, etc. Which company provides the most interesting working environment, as per your opinion? Or, in case you may want to mention some takeaways from more than one companies? Customer facing organisations spend a lot of effort and money in trying to understand their customers, so that they can tailor make products which will make them want to come back again and again. A few organisations are now beginning to look at their own employees as their internal customers, because they realize that only by retaining their best talents will they be able to build teams that will serve their customers well. With this approach, such organistaions are making radical changes to their HR policies and designing experiences for their employees which keep them at their happiest and productive best. Such experiences for their employees are aligned with organizational mission, and the workplace becomes a reflection of this. This is where the future lies. What is the one (or more) thing every workplace must have, according to you? The short answer to that is that one size does not fit all and the question may not be relevant today. This question would have been relevant 10-15 years back. A workspace today is no more a physical entity but a mix of the physical and the digital. Such a workspace needs to be reflective of an organisation’s ethos and values. The key is that it has to be human centric, and for that, organisations need to treat their workers as their customers. So a lot of the new workspaces are turning out to be a blend of different types of spaces that respect the needs and aspirations of different types of people and of different types of work. This is a growing tribe, and is reflective of a generation that is always on the move. This is a generation that carries their work and life in their pockets, in their mobile devices. This will grown and is not likely to go away very soon. I still prefer traditional printed books. I myself spend a lot of time staring at mobile devices and computer screens daily. So reading a printed book is like a break from all the text on the screen. We cannot get away from this, can we? Social networks are becoming smarter and smarter with machine learning. It is a very powerful medium and has overtaken traditional media in importance for several business segments. It is surely useful in spreading important causes and allows even individuals to participate as the propagator of that message or even to engage; something that is not possible with traditional media. The low entry barrier has a flip side; the authenticity of messages out there can be questioned and it may become difficult to weed out the truth. So we need to be careful; far more careful than traditional media, when using social media networks. Someone said, practice what you preach. Well, the book may appear to be one. When we begin to look at modern day workers as humans, we seem to know less and less, as we dive into human minds. My books have been my learnings and observations from my work, which is constantly evolving as the world around us change fast. Clients and even readers are helping in this, by co-creating the ‘future of work’. I would love to hear back from readers and explore ways to collaborate and co-create.